Can you believe the holidays are here? You probably can—you just survived thrived during Black Friday and Cyber Monday and now, you’re deep into shipping all those orders. The recent one-two punch of Black Friday and Cyber Monday + Christmas looming on the horizon means business has picked up. This year, we made the infographic the perfect fit for a standard laser printer, at 8.5 x 11. Click here to download a printer-friendly PDF version. You can also save this as a desktop background and always have it available! If you plan on using USPS services this year, get ahead of the game and order your supplies now! For big, ginormous orders, call 800-610-8734. You can also use that number to set-up standing monthly, bi-monthly or quarterly orders so you don’t have to use USPS.com or drop in to the post office. Of course, these aren’t the only dates that matter. 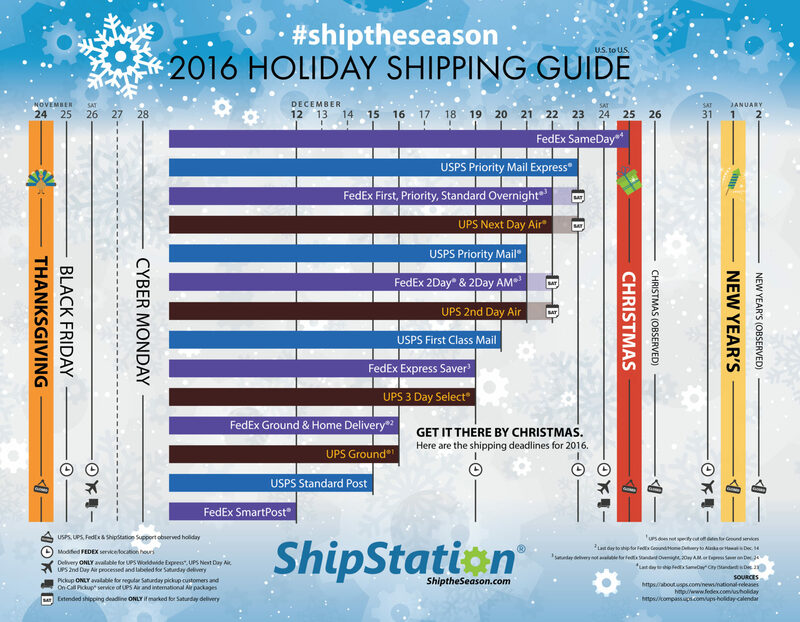 If you ship to or from military addresses or internationally in general, Stamps.com collected the recommended ship by dates directly from USPS. Click here to see those dates. For our Canadian users, see Canada Post’s suggested ship by dates by clicking here. If you’re in Australia, shipping with Australia Post, check out their standard delivery timetables using their Parcel Post service by clicking here. And because we care about y’all, we have some big things planned in the coming weeks! We’re putting our focus on getting your branding up-to-speed using ShipStation’s features and partners. From packing slips & labels to emails to the Branded Tracking Page to social media, we’ll have you covered! Subscribe to our newsletter (it’s on the sidebar on the right) and follow us on Facebook, Twitter, and Instagram to stay up-to-date! It’s not my first time to visit thjs web site, i am visiting this website dailly and take nice data from here every day.